If you want to add a touch of Zen to your patio or garden, here's a pleasing solution as compact as it is easy to care for. The simple box construction is plenty sturdy, a thick pond liner contains the water, and a plug-in aerator provides the circulation and oxygen that plants and fish need to thrive in a small space. Lower in several hardy waterlilies, and the perennials will send up shoots that keep you in daily blooms of pink, red, white, and yellow from June through August. Come fall, just shear off the shoots and they'll come back bigger and bolder next spring. As long as the water doesn't freeze solid in winter, these lilies will survive in place. 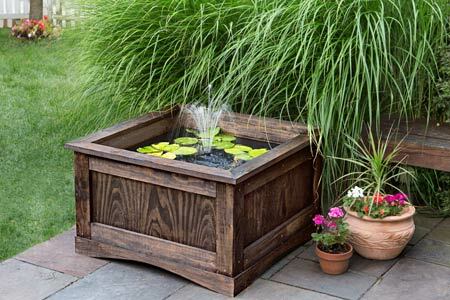 Follow along as This Old House contributor Christopher Beidel, owner of Pernt, a handmade-furniture store in Brooklyn, New York, walks you through the step-by-step of building this aqua-gardener's starter project. Download and print the lily pond cut list.